It’s my first close encounter with this Finnish band called <?xml:namespace prefix = st1 ns = "urn:schemas-microsoft-com:office:smarttags" />HUMAN TEMPLE and maybe my last or<?xml:namespace prefix = o ns = "urn:schemas-microsoft-com:office:office" /> maybe not. 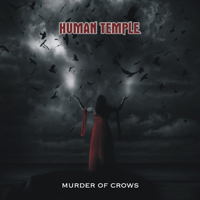 But one thing is for sure... I’m caught somewhere between heaven and hell when it comes to this CD called ‘Murder of Crows’ (their second full-length release). There’s nothing wrong with the song writing and there is nothing wrong with the production or their ability to handle their instruments. I’m just not fully convinced. We are talking AOR/melodic hard rock here... just think of a softer version of Altaria’s ‘Divinity’ (if you’re familiar with this release?) and you have a pretty good idea what to expect. Well... the songs are quite cosy and enjoyable but they have turned out a bit too polished for my taste. It’s not a crappy album and it deserves a listen or two but it doesn’t ROCK! Hopefully they will put the guitars more upfront on their next release. Check it out and decide for yourselves.